GOOD NEWS CONSULTING, Inc. - CULTURE OF C.A.R.E. 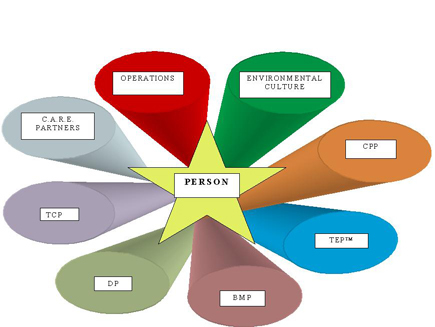 GOOD NEWS CONSULTING, Inc. has developed the CULTURE OF C.A.R.E.TMMODEL (COC) to facilitate transformation to a person-centered model from an institutional model of care. Care Management Program (CMP) - protocols for consistent daily routine, daily engagement and person-centered care based on Life History, preferences and abilities. Therapeutic Engagement Program (TEP)TM - protocols for providing evidence-based group therapeutic engagement sessions as part of the consistent daily routine that provide meaning to all people involved and are based on their preferences and abilities. Behavior Management Program (BMP) - protocols for providing effective interventions to minimize typical behaviors often seen in people with dementia. Dining Program (DP) - protocols for person-centered dining. Training and Compentency Program (TCP)TM - evidence-based dementia care training sessions that will lead to team member competencies to insure excellence in dementia care. Provision for a competency ladder that leads to a "specialized position". Quality Performance Improvement Management (QPIM) - outcome-based QA/QI protocol.